Now that Google I/O is over with and a potential Android 4.3 release date is in the wild, the hypebeasting of features will undoubtedly start to pick up. The first to kick off the fun is one of our favorite apps, Light Flow. For those not familiar, Light Flow is the best notification manager in the business, as it provides you with more tools and options for notifications settings than any other app. It’s also designed incredibly well and always seems to have a major update around the corner. 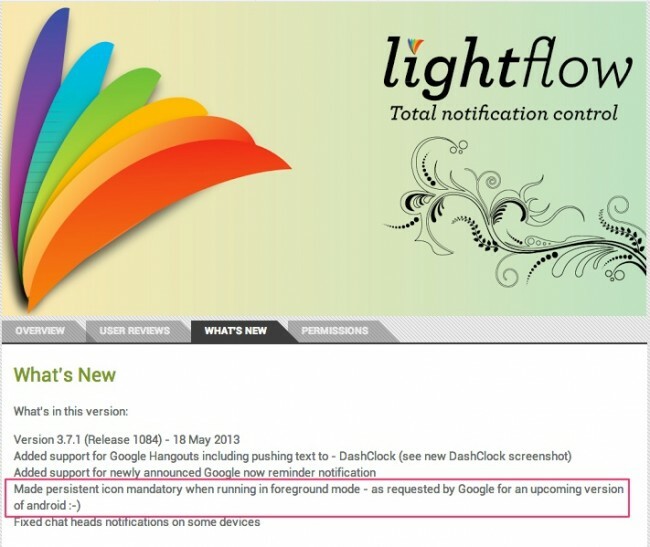 So what does Light Flow have to do with the next version of Android? In their latest update that was released this afternoon, they are claiming to have made a change towards a mandatory persistent notification icon because Google has requested this become a standard in an “upcoming version of Android.” Their description for this new requirement mentions that any app running in “foreground mode” must place a persistent notification icon in the notification bar. I’m assuming this is a lot like how Pebble works when it’s paired to your phone – there is always a Pebble icon showing that you are connected. The update also includes support for Hangouts, including pushing text to DashClock, and fixed notifications with Chat Heads for more devices. But the big mention here has to be with the “upcoming version of Android,” which we are all expecting to be Android 4.3. I know this doesn’t give us much, nor is it a feature that anyone will run and show off to friends, but this potentially adds to the thought that we will see the next version of Android at any moment.